Australia’s Bradley Santer made his way into the figure skating world in an unusual way. “I had always wanted to have lessons, but my parents wouldn’t let me go. Finally, they let me have them as a reward for getting a ‘high distinction’ in a piano exam.” Santer had been playing the piano since he was six. But now, with training mornings and evenings and a full load of university courses, he has little time for music. Santer, the 19-year-old Australian junior champion in 2001, finished second in seniors this season. 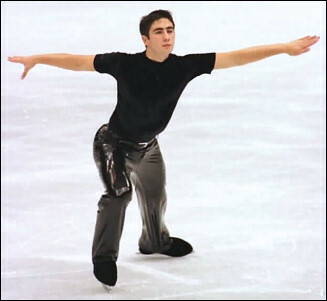 He has competed in the last three Four Continents Championships, moving up each year and finishing 14th in 2002. He finished 37th in his only World Championships in 2000 and 28th in the 2001 World Junior Championships. Skating runs in Santer’s family. His father, Michael is a former skater who coached for over 20 years and managed a Premiership-winning hockey team on which Santer’s brother played. His brother still plays the game, but these days Santer is the only figure skater in the family. Santer practices for about 18-20 hours a week in Sydney. His coaches are Andrei Pachin, whose wife Galina also assists with his choreography. Santer likes to skate to music with a theme. This season, he is using “Clubbed to Death” from “The Matrix” soundtrack for his short and “Two Guitars”, Russian gypsy music, for his long. He listens to all kinds of music, especially rap, rhythm and blues, and alternative music. Some of his favorite musicians are Jay-Z, Lifehouse, the Dave Matthews Band, and Godsmack. Like most Australians, Santer plays a lot of sports including rugby and cricket. He enjoys weightlifting, water skiing, going out with friends, and driving fast. At the cinema, his tastes run towards thrillers, action and horror movies. When reading he prefers similar fare with authors such as John Grisham and Patricia Cornwall. Santer also collects competition memorabilia and skating ornaments. He also likes to travel, preferably to America, but enjoyed most a trip to Chemnitz, Russia, Hamar, and Zagreb in the fall of 2000. When he finishes competing, he hopes to do some professional shows. Santer said he “would love to coach at an international level.” Otherwise, he’s preparing for a career in law or marketing. He’s in his first year at the University of Sydney studying behavioural sciences. But for now Santer is focusing on the triple Axel and quad toe. He knows he must have them in his repertoire if he is to be really competitive internationally.